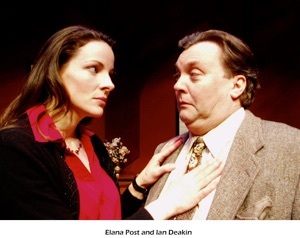 In 2001 Stratford presented Edward Albee’s best-known work “Who’s Afraid of Virginia Woolf?” (1962). Now the Festival gives us Albee’s “A Delicate Balance” written four years later, a work that is very much a companion piece to the earlier play. Where “Virginia Woolf” is loud, gritty and in your face, “Balance” is more subdued, more abstract and more enigmatic. Both plays deal with nights of confusion and terror and battles for territory ending on a symbolic Sunday morning, but where "Virginia Woolf" presents us with some resolution of the central problem, "A Delicate Balance" does not. Even the central problem itself is not clear in the later play. Stratford has assembled a very fine cast for its production who under Diana Leblanc’s insightful direction make the multiple layers of meaning clearer that I’ve ever seen before yet without losing the play’s fundamental sense of mystery. The play is set in the smart living room of the wealthy Agnes and Tobias. Agnes is meditating aloud about the pleasure it would be to go mad, realizing that as long as she can speculate on the subject it will not have happened. The main thorn in proper Agnes's side is her proudly drunken sister Claire, who has come to live with them after quitting an Alcoholics Anonymous retreat. Soon Agnes and Tobias learn that their daughter Julia has broken up with her fourth husband and will also be returning home to live with them. Before Julia arrives, however, Harry and Edna, best friends of Agnes and Tobias, pay a surprise visit. In fact, Harry and Edna have not just come to visit but to live with Agnes and Tobias in order to escape the unnamed "terror" that has suddenly made their own home uninhabitable. This intrusion which so closely treads on the boundary of friendship and on the rights of host and guest, upsets "the delicate balance" of the household in ways grievous to all but Claire, who watches everything, including her own life, from the sidelines. Leblanc has given us such a well-spoken, well-considered production that numerous aspects of the structure and meaning of this problematic play become clear. First of all she underlines the presence of so many sets of doubles among the characters. We first meet Tobias with Agnes and Claire, two sisters with exactly opposite attributes--first representing order, the second disorder. When Harry and Edna enter fleeing an unnamable terror, it is clear that they are alter egos of Tobias and Agnes, who have never fully dealt with the unspoken void in their lives, the death of their son Teddy, which forced them apart and alienated their daughter Julia. Indeed, when Harry and Edna settle in, they begin acting exactly like Tobias and Agnes, a point Leblanc emphasizes by placing them on stage in the same locations where we first met Tobias and Agnes. When Julia enters a second parallel is created. We have two sets of intruders into the ordered life of Agnes and Tobias--Harry and Edna who are their “closest friends” and Claire and Julia, who are relatives. This sets up a central question of the play, “Who has a greater claim on our love--a close friend or a relative we may not actually like?” How important really is a blood relation in determining who does or does not have a claim on our time and space? When Tobias is alone with the three women of his family in Act 3 he compares them to the three witches in “Macbeth”. Given their three different ages, it not hard to see how this looks forward to Albee’s “Three Tall Women” (1991) in which three actors of different ages represent the same wife of a dying husband. More than once, Leblanc underscores the remark that Julia is on the way to turning into Claire. The interaction of these multiple parallels brings out a remarkably rich view of life as a balancing act between order and disorder, sanity and madness, repression and expression, male and female and the roles of host and guest, friend and intruder, friend and relative. By the symbolic placement of characters in significant locations on stage and by having each actor subtly emphasize key words and phrases, we see the reduplications Albee has created and hear Albee’s themes echo through his prose turning it almost into a kind of poetry. The production was originally to have starred the late William Hutt as Tobias. Doubtless his presence would have changed the dynamics on stage. As it is Martha Henry as Agnes and Fiona Reid as Claire dominate the piece with David Fox’s Tobias remaining a quiet figure in the background until his remarkable outburst near the end. Henry speaks the long, complex speeches Albee gives Agnes with such beauty that it is a pleasure in itself just to hear them. Yet, this formal beauty has a negative side that Henry shows in Agnes’s obsession with order, constantly arranging objects and furniture and adjusting other people’s clothing. Reid is the perfect foil, constantly making jabs at others to see how far she can go as well as satirizing herself as beyond help. Reid who played Claire for CanStage in 1998 has the acidity and timing of Albee’s equivalent of Shakespeare’s “all-licensed Fool” down pat. Fox inevitably comes off as weak in comparison with this formidable pair, and I missed the undercurrent of fear that should be present in him from the beginning to show that he, too, is struggling with his own “terror”. Nevertheless, he rises magnificently to the challenge of Tobias’s long speech pleading with Harry to stay, imbuing it with such raw emotion it is almost embarrassing to watch the character so totally abase himself. Patricia Collins is excellent as Edna moving from being petrified by fear in her first appearance to surprising imperiousness as Edna settles in. As Harry, James Blendick is cast against type. He has such stage presence and such a rich voice, it is difficult to believe he could ever be in terror, but his muted, restrained performance helps make his situation plausible. Michelle Giroux communicates Julia’s anger but never the shame or distress her character would likely feel after so many failures. Astrid Janson’s design captures the upper-class milieu but some of her costumes are unbecoming. The pleated shawl she gives Martha Henry hangs in such a way as to make her look osteoporotic, which she certainly is not. Janson has Julia arrive in a high-fashion leather outfit with stiletto boots, appropriate for a single bar but not for a woman running home after a failed a marriage. Louise Guinand’s lighting is subtly beautiful throughout especially in conjuring up the dawn of a new day at the end. There’s no doubt that “A Delicate Balance” is a deliberately puzzling play where Albee, true to his absurdist background, portrays metaphorical situations naturalistically. Yet, Leblanc, Henry, Reid and Collins ensure that this puzzle is always intriguing and often very funny. If you know Albee only from “Virginia Woolf”, catch this show to get a more rounded view of a great playwright. Photo: David Fox and Martha Henry. ©David Hou.